The Syracuse University Brass Ensemble, directed by James T. Spencer, is ringing in the holidays with four family concerts. All events are free and open to the public, unless otherwise indicated. For more information, call (315) 786-2458, or visit Friends of SU Brass Ensemble on Facebook. Sunday, Nov. 28, at 7 p.m.
Sunday, Dec. 5, at 7:30 p.m.
Saturday, Dec. 11, at 7 p.m.
Sunday, Dec. 12, at 3 p.m. 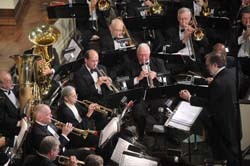 The concerts span more than four centuries of repertoire, and draw on the following: “Christmas Festival” (Leroy Anderson); “O Come, All Ye Faithful” (traditional, arranged by Sir David Willcocks); “A Christmas Finale” (Paul Lovatt-Cooper); “Son of Mary” (John W. Peterson), featuring soprano Laura Enslin; “Yule Dance” (Philip Harper”); “Flourish and Dances” (Kevin Norbury); “The 12 Days of Christmas” (traditional, arranged by Stephen Bulla); “Silent Night” (Franz Xavier Gruber); “Colas Breugnon” Overture (Dmitri Kabalevsky), conducted by associate director Tom Quirk; “An American in Paris” (George Gershwin); “Sparks” (Kenneth J. Alford), featuring xylophonist Mary Kasprzyk; and “Tres Cantus Laudendi” (Mack Wilberg). Soprano Enslin is an affiliate artist in SU’s College of Visual and Performing Arts. In addition to being featured in this year’s Syracuse Symphony Holiday Pops series, she has appeared with the Syracuse Opera, Society for New Music, Lake Placid Sinfonietta and Buffalo Philharmonic Orchestra. In 2008, Enslin premiered “In Praise of Science,” written for her and SUBE by Pulitzer Prize-winning composer Robert Ward. Quirk ’75, G’78 is an accomplished conductor, trumpet player and educator. He recently retired from teaching, after 30 years of service in the Cortland and Oswego public school systems and at SUNY Cortland and SUNY Oswego. The Liverpool resident is also a sought-after adjudicator and private instructor. Percussionist Kasprzyk ’03 is a member of SUBE, and has played with the Syracuse Summer Festival Orchestra, Onondaga Civic Symphony Orchestra, and various community groups. By day, she is a video editor and technical specialist in SU’s Video Production Unit, where her work on the “Holidays at Hendricks” broadcasts has garnered two Telly Awards. SUBE is a nationally recognized 35-piece ensemble housed in The College of Arts and Sciences. The group features professional, amateur and student musicians from Central New York, many of whom are doctors, teachers and retirees. In addition to performing at official functions at SU and Le Moyne College, SUBE presents more than a dozen public concerts a year, including the award-winning “Holidays at Hendricks,” broadcast on WCNY TV and radio throughout New York State and in parts of Canada. DVD’s of the “Holidays at Hendricks” performance will be available at the SU Bookstore in the Schine Student Center.